For this serial entrepreneur and real estate developer, his newest project—perhaps his final—has been a 14-year labor of love. Tim Charlwood is an outdoor adventurist who’s sailed and ballooned all over the world. As a founding member of Mustique Island (a private locale in the Grenadines), he’s spent time with fellow Brits Mick Jagger, David Bowie and others. But when his adrenaline-seeking lifestyle brought him to the 527 acres of preserved wildlife habitat he now refers to as Sanctuary Utah, he decided to make the secluded area between Huntsville, Utah and Park City his home. His idea: beyond a private Heli Ski Ranch, he’d make the exclusive area, which sits amid 10,000 acres of open space, into something remarkable—a luxury real estate masterpiece with 13 unique and remarkable homes. He conceived a business model that had never been done. Unlike the luxury time shares in locations like Aspen and elsewhere, he envisioned a private community of like-minded individuals who would not rent by the week, but would literally own their selected properties for the month they select every year—a model that required realtors and attorneys to entirely re-write the shared ownership rules. Owners return to their chosen properties again and again, with their linens and personal positions locked away to await their return. Beyond the ownership model is where the private community of Sanctuary Utah begins. There are no fences, giving owners full access to an extensive trail system that connects with each property for Nordic skiing in the Winter and biking/hiking/running through the seasons. At the peak of the development, a domed facility with 360-degree views facilitates meetings, masterminds, private gatherings and classes, next to a private heli-pad for skiing or property access. A shared clubhouse facility houses a fleet of recreational toys including snowmobiles, electric fat bikes, off-road vehicles, and a wake-surfing boat. For those inclined, there is access to a professional chef. The property is geared to preservation, as well. Near the first home to open, The Vachery, lies a wildlife hide with salt licks and seclusion for regional wildlife, creating yet another experience for members and visitors who come to commune with nature. Each of the homes is unique, with names like Eagle’s Nest, Kokopelli Outlook and Curtain Bluff. As I visited the first to open, the Vachary, I was met by soaring windows and angles reminiscent of Frank Lloyd Wright (this is not a coincidence—there is a connection, Charlwood said). By design, Sanctuary’s homes are environment friendly with geothermal heating and cooling, zero waste water management, xeriscape landscaping and designs that leverage solar energy use. Designed by James L. Carroll, of Salt Lake City, the plans make every bedroom a luxury suite, with open areas for gathering and entertaining in the central parts of the homes. One of the big appeals for Charlwood is that the property is five minutes from Huntsville, Utah—a tucked-in community without stoplights, but with lakeside access to Sanctuary’s members for boating and racing events. 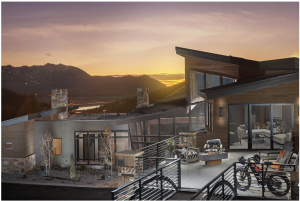 The seclusion is a major aspect of the project’s appeal–while Sanctuary is largely hidden from view, it is a quick 15 minutes from Utah’s favorite uncrowded ski resorts, Snowbasin and Powder Mountain. It is only 55 minutes from SLC International Airport, and a little beyond an hour to Park City. Another unique aspect of Charlwood’s strategy is that he has avoided advertising and traditional press. Although the development has been 14 years in the making, the only coverage to date is a cover story and photographic reviewof the near-secret destination in the current December issue of Western Journal Magazine. Never stop striving for the goal you envision, regardless of what anyone says. Charlwood’s attorneys had to re-write the rules of shared ownership for Sanctuary, which was vital to the outcome—creation of a like-minded community of owners who are “seekers of the exceptional,” where outdoor experience and high-altitude recreation takes precedence over white-glove service and material possessions. Respect for nature and environment is paramount. While there would have been many faster and more economical ways to complete the development, when Charlwood explained the reasoning for his thinking, his investors were entirely on board. Create a project and environment that will naturally appeal to the customers you want to obtain. High achievers, entrepreneurial leaders, founders of some of the most remarkable organizations in the world have naturally found their way to the Sanctuary project during its development. Charlwood is excited for the synergies that will naturally emerge from the community of leaders who make Sanctuary their permanent get-away-from-society homes. Use every opportunity to advance your highest visions and mission. Charlwood has designed every aspect of the homes and shared facilities to be handicap accessible. Additionally, he is asking owners to dedicate their unused time for use by philanthropic organizations. He wants to extend the beauty, the inspiration and the creative opportunities of the Sanctuary environment to as many of the organizations as possible that are creating positive change in the world. Making his vision and mission apparent in all he does has been more effective than traditional marketing, Charlwood explains. The right people are inclined to make others with the same sensibilities aware of the property as well. Although the project is only now approaching its formal opening, Charlwood has been met with multiple offers from entrepreneurs who’ve wanted to buy not just a month a year in one of the homes, but the entire development.